Many of us, including myself, grew up with huge dreams and little or no musical talent. We would soon discover a musician or band we liked and we would listen to and buy every one of their albums and songs maybe hoping someday we would be able to join a band and perform for our friends and family or a stranger or two. On some occasions we might venture to a public space or venue and come across someone playing their guitar or keyboard to a group of onlookers who might be enjoying the street performances as much as we would. For me, growing up in Southern California, my Father would take us to Olvera Street, the old Pike in Long Beach or to the Redondo Beach Pier where we would listen to the folk singers strumming their guitars and singing beautiful melodies and songs as we slurped up ice cream cones or balanced our hot dogs and cotton candy trying not to drop them on the side walk. Little did I know at the time that these street performers, then, as well as now, were known as “Buskers” – musicians and street performers who, since the beginning of recorded history, have been entertaining crowds with their amazing talents and musical abilities. This week our featured up and coming artist, Katie Ferrara, is such a person and she is no stranger to street performing – in fact she has won some prestigious busking awards around the world and even has a small town in Italy with the same family name (Ferrara) which is home to the Buskers festival, a non-competitive parade of the best street musicians. In terms of tradition and dimension, The Buskers Festival held in Ferrara Italy is the most important festival of its kind in the world. Katie will be releasing her 3rd album – Dream Catchers – in a few days which we are very excited about and as with her previous work will deliver a soothing blend of authentic home-grown folk-pop. Her songs are genuine and emotional and perfect for the free-spirited, curious and open-minded individuals that might stumble upon her on a given night in Santa Monica or in Burbank. We had a chance recently to run a few questions by her to help learn more about her music, her early path to becoming a busker and what we might expect from her off her Dream Catcher album. So when did you first pick up a guitar? Are you self-taught? I started playing guitar when I was in high school. My mom taught me how to play when I was a teenager and when I got to college, I taught myself by learning all my favorite songs. I also learned a lot from jamming with friends on campus and singing in different bands. I can play ukulele and a bit of keyboard. We heard you began your music career while working at Starbucks in London, England. How did you go from barista to performer? When I was in London I would frequently visit Wunjo guitars on Denmark Street because I needed to buy a new guitar. I came to the UK with a travel sized Martin with no pick-up and wanted something that I could perform with easily in venues. On one of my visits to the shop, I met my French friend Jonathan, who produced my first two EP’s “When Love’s Not Around” and “Naturally”. We started recording when I had nights off from Starbucks. When I wasn’t working, I went to different open mics in the city to play my songs and get feedback from an audience. For me, going to open mics was the gateway to becoming a performer because I gained a lot of support from the musicians around me and found a safe place to practice new songs without having to do a full blown show. Is “busking” something in your blood or did you develop your love for playing in public over time? Honestly, I feel like busking isn’t something that I was born to do. It took a lot of trial and error before I figured out a way to feel comfortable doing it. The most difficult thing about performing out on the street is simply logistics and not so much working up the courage to sing. You have to think on your feet, become a problem solver and be ready to improvise. The first time I ever busked on the Santa Monica Promenade, I had to move from my spot because I had set up too close to a fire-hydrant. My amp died that day and I couldn’t hear myself amongst the other performers on the street. Carrying all my equipment was also really difficult because I got tired easily holding my guitar, amp and mic stand in just my two hands. Over time, I figured out the best time of day to play, I bought a cart and a better amp, and picked the best songs in my repertoire to sing. What really made busking enjoyable for me was being able to play one of my songs and have someone stop whatever it was they were doing and just listen. Maybe the conditions weren’t perfect. I’ve played while it’s raining, on 90 degree summer days, and to empty streets late at night. To see someone make a choice to stop and to speak to them face to face made me feel confident. When you see that your music makes children dance and people laugh, you know you are doing your job as an artist. Its these kinds of experiences that really makes me love busking. Every time I go outside to play, I wind up with a cool story to tell, or I meet new people, or I discover a part of LA that I never would have gone to before! I think I love busking because it’s a way for me to explore different aspects of performing, travel, and be inspired by my surroundings. When did you decide to come back to the states and further your musical career? I came back to the US in 2012 after finishing recording my 2nd EP. I felt like there was a lot of opportunity in LA that I hadn’t explored before I went abroad and I wanted to try giving it a shot here before making any big moves again. Were you back in the U.S. when you won the Street Performing Contest “Feeling the Street”? What was that like to win that among so many performers? I felt like my music career had just gone to a whole new level. I gained a lot of respect from friends and fellow musicians in LA because I wasn’t just getting known on a local level, but globally with the trip to New Zealand. When I found out that I had won the contest, it was one of the happiest days of my life! At the same time, I felt like there was a lot of pressure to impress people around me and produce music that was a different style than my own. It was an experience that challenged me to grow as an artist and see a new country! When watching your music videos I can’t help but notice how natural and authentic you are when you sing. Where does that passion and love for music come from? I’m passionate about music because it’s been a great outlet for me to express my emotions and connect with others. I feel like when I am singing I can be my authentic self. In a way I don’t feel like I’m “performing” in the sense that I’m acting out a certain character to impress people. I feel like people are just seeing another side of my personality that isn’t normally seen if they meet me for the first time. What is the biggest highlight in your music career to date? I think the biggest highlight in my music career so far has been my recent busking tour to the UK and Italy. This trip was something I wanted to do for a very long time. Last year, I did some research on my last name which is “Ferrara” and found out that it is a city in northern Italy that hosts an international busking festival every year in August. I’ve always been told that I should change my last name to a more English sounding one, because I would be able to brand myself better as an artist. When I found out about this festival, l felt like I had been blessed with a sacred name and somehow it was my destiny to be a busker! I wanted to investigate this coincidence a bit more a learn about my family history, so I applied to the festival. When I found out that accepted as a fringe accredited artist, I booked myself a ticket to London. For a week, I went busking along the Southbank next to the Thames River. I also booked a show at the Troubadour in Earls Court where I reconnected with old friends and family. Then I took a plane to Bologna and from there I took a bus to Ferrara and met up with Borja Catenesi, the guitarist from the Feeling the Street band along with his girlfriend Suzanne. We jammed at the festival and also took a day trip to Bologna where I learned how to get a permit from the police station in order to street perform in the city piazza. The best part of the trip was the night I sold out of CD’s at the festival and played to a circle of about 50 people on a 900 year old street in the heart of the city. From that night I was able to pay for my travel all through busking. It’s been my dream to be able to travel through music and I hope that in the future I will book more tours across America and abroad through the release of my new EP. Your new E.P. Dream Catcher is coming out next month in October – what is the theme of the album? The album centers around the conflict between following your passions and having security in a romantic relationship. I think it’s a theme that a lot of 20 somethings can relate to, especially because this is the time in our lives when we’re finding ourselves and figuring out what our purpose is in life. I called the EP “Dream Catcher” because while I was writing the album last year, I felt like I was chasing after my music career while trying to hold onto so many relationships that weren’t exactly healthy to begin with. I wanted to write something upbeat to keep me going and inspire other people to just be themselves. These songs are bursts in time where I got a chance to breathe and reflect on what was going on in my life. How does the music and songs differ from your earlier albums? I think the songwriting on this album displays a different level of musicianship than my previous EP’s. With this album, I explored different song structures and lyrical hooks. When I first started recording, I didn’t have a defined sound as an artist. Some of the songs were folky, some were jazzy and funky, and some had minimal production. With this new EP, I feel comfortable calling myself a “Folk-Pop” artist. I’ve got instruments like cello, upright bass, ukulele, acoustic guitar, Ebo, and lap steel in the mix. The production is definitely more collaborative than my previous releases. I can’t really say that this album is completely mine—it wouldn’t be possible without the help of my producer Patrick Joseph and the talented musicians I met at shows at the Hotel Café last year. Everyone brought their own unique ideas which to me, created a unique sounding album. Give us three words that best describes the album and what comes to mind when you think of it? Relaxing, Hopeful, Charming . When I hear the title I think of sunset melting into the ocean for some reason. Tell us a little about the writing process – did the songs on your Dream Catcher come to you in a dream or were they something you worked on for a while? I wrote these songs slowly over the course of last year. They started out as melodic and lyrical ideas that came to me while I was driving to gigs in LA. When I had free time, I jammed with different people and they transformed into songs which I integrated into my set list when I busked. When I’m driving, it’s sometimes the only time when I can focus on one thing and reflect on what’s going on around me. Many of the lyrical ideas also came when I had a chance to relax at home. On the album cover, there is a picture of you in a pretty blue dress with what looks like the ocean behind you – where was this photo taken and why did you select that place for your album? This photo was taken on the Santa Monica Pier. I chose this location because I’ve spent many days and nights performing out on the boardwalk over looking the sea. I find the water to be inspiring. You can look out across the ocean and not know what’s on the other side. I love letting my imagination run wild when I’m playing out there. I also find the color blue to be calming and a good reflection of the music. Is there any one song you would like to share with everyone prior to the big album release and if you can’t right now what would it be if you could and why? I would share the song “Jackets” because I love the instrumental arrangement and I think it best reflects the central theme of the album: conflict between being in a relationship and pursuing a career. When I wrote the song, I was so happy to be with someone and have that security, but at the same time, I wasn’t satisfied with myself. I felt like I was putting my music aside or having to hide what I was truly meant to do—which is to sing! The imagery of the Jacket came to mind because I was thinking about what it means when a guy offers his jacket to a girl when she’s cold. Somehow that transferred into the lyrics of the song. Lastly – you are still very active playing the streets, where are some of your favorite spots to play and when can we see you next? I love playing in downtown Burbank because it’s close to where I live! I also love playing at the Santa Monica Pier, Melrose Trading Post and the Nickel Market in downtown LA. My next big gig is actually going to be at the new Hotel Café second stage with s full band on Oct 22nd for the CD release show. I know we said the last question was the last one but we always like asking our guest for a shout out to someone we should keep an eye out for. 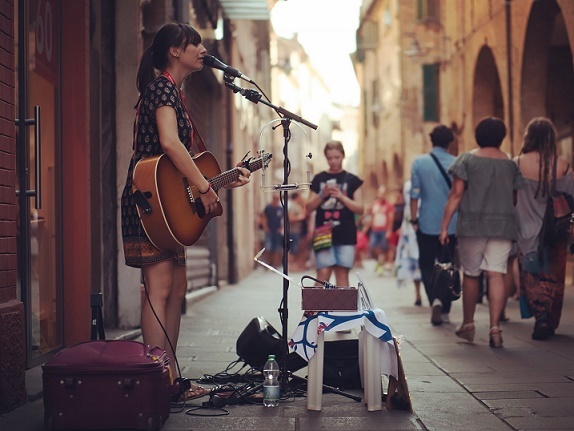 Who are a few of your favorite up and coming “buskers” and where can we find them? Tudor Williams-I met him in Burbank in front of the Gap on Palm avenue which is a popular place to perform. What I really love about his music is the songwriting. He’s got a variety of songs in his repertoire, some are serious and others are just plain funny. He reminds me of Blake Mills in this respect. Musically, his guitar and melodies sound really deep yet the lyrics to some of his songs contrast a charming, humorous side to his personality. Check out his song “Somethin bout a blond woman”. Mimi Gilbert- She’s a master of looping and reminds me a bit of Joni Mitchell. You can catch her street performing in Portland and last time I talked to her she had gotten back from a busking tour in New Orleans. I found her music after looking at some of the artists on this years Feeling the Street website. Her album “Strangers Won’t Exist” will blow you away. Previous Post Is this Political Ad from Trump too Dangerous for Prime Time? Next Post If Dark Matter Can’t Be Seen, What About Ghosts?